Distribute folded brochures to patrons and customers professionally. 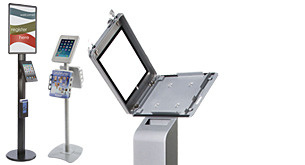 Large variety of displays for retail shops, lobbies, and waiting rooms. Folding and collapsible literature displays for the traveling professional. Weather rated holders for: Brochures, Magazines, Pamphlets, and Business Cards. 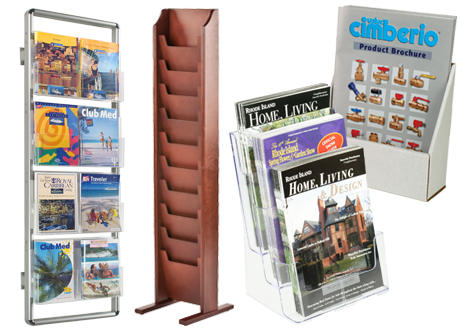 Combine brochures and magazines within customizable racks. Remove clutter in the office with wall-mounted or hanging file organizers. Present digital interactions while offering catalogs and brochures. Attend the next trade show with a tabletop literature display. Looking for a way to save counter top space and have more organization in your business? The best way to do so would be with our brochure holders, also known as literature racks. Our acrylic pamphlet stands are for flyer, sign, leaflet, magazine, catalog, and brochure display. We carry thousands of competitively priced models in stock and ready to ship! We offer clear acrylic brochure holders at wholesale prices with same day shipping on most in-stock orders placed before 3PM EST. If you want to combine your brochures and literature, you can do so by selecting countertop or floor standing single pocket, multi-pocket, combination or multi-tiered styles. Most of our clear acrylic brochure holder displays are as attractive as they are portable and lightweight. 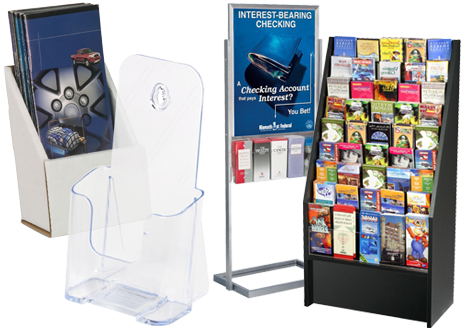 These acrylic displays, literature holders are designed to provide an easy way for the public to take away company and/or product information. 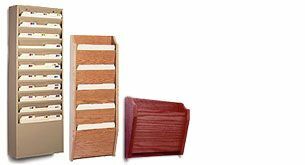 Wood and plastic models are used in banks, business offices, reception areas, medical offices, museums, law firms, state agencies, libraries and school offices - anywhere you want to get your message noticed. Countertop brochure holders with just a single pocket can provide you and your business with valuable marketing and advertising. We manufacturer wall mounted racks to display literature on your walls. 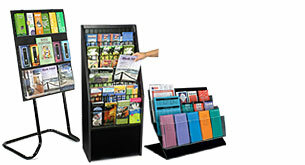 Acrylic brochure displays are great for saving room on the floor and tables. One of the most popular products are the plastic flyer holders of our RP wall mount rack line. These injection-molded units are super easy to install and come in multi-pocket variations ranging from 6 to 24 individual pockets. An additional feature of the RP line is their ability for customization, thanks to the included divider pegs that instantly change the visual layout to your liking. These wholesale literature display holders are available in a variety of sizes to accommodate the quantity of materials - leaflets - tri-folds - magazines - you need to become organized. Wall mount magazine racks made from solid wood or clear acrylic would look great in any professional office setting. You can mount your literature display on the wall of your reception area for easy access to its contents. iPad kiosks provide visual and hands-on marketing for your business. By engaging the touchscreens for digital information, visitors and customers take in your targeted content about company info, new products, and much more. Our selection of iPad kiosks, with custom-printed banners and literature trays, combine to create a three-part marketing punch! Interaction is the goal. Promote your business whether you're inside a retail mall or out on the trade show floor. 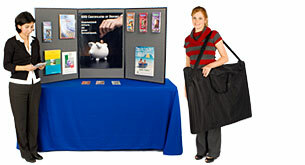 Portable tradeshow displays feature collapsible designs that are intended for traveling to and from events. We sell a wide variety of floor-standing literature stands as well as tri-fold display boards for tabletop presentations. Not your elementary school versions made from cheap cardboard, our display boards are professional products that feature velcro-receptive fabric in a number of attractive colors. Brochure pocket accessories can be attached to the boards that give the show exhibitor more ways for marketing their business. Collapsible floor stands are available with adjustable pockets to fit various sizes of literature, and they are available in both plastic or metal to complement and accent your already established décor on sale - in stock and ready to ship. Contact our friendly, expertly trained customer servieces representatives today. Explore our site directory for detailed descriptions of all of our different lines of literature displays.